There is nothing better than watching an old, dilapidated structure transform into a modern and cutting-edge piece of design. This is exactly what we are going to witness today! 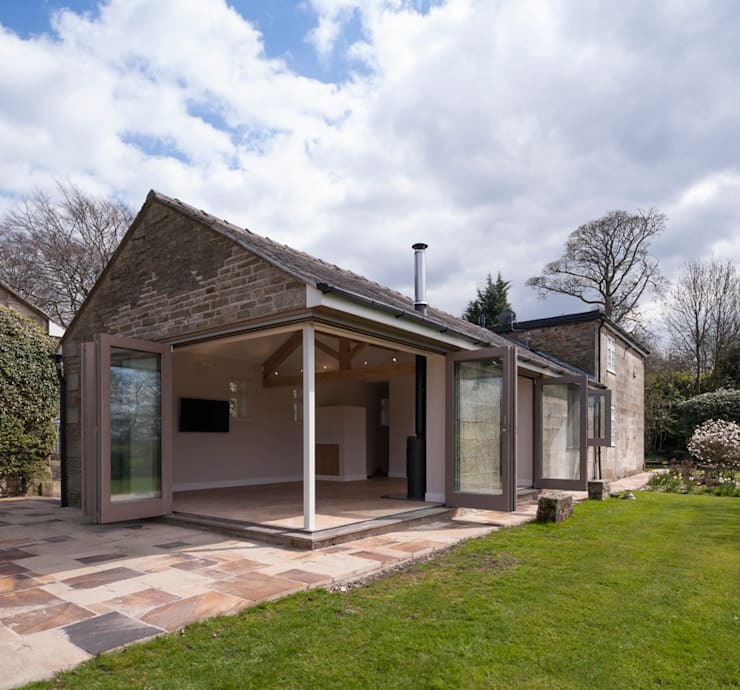 Design professionals, Fraher Architects, took an old garden cottage, which was part of an old stable block and a period house, and transformed it into a gorgeous and modern space that still features some of its original features. This innovative and trendy home fits beautifully into the surrounds. Taking into account the views and the landscape, this home still has its country roots, while bringing in a very fresh look and feel. From this angle, we can see how the garden cottage blends seamlessly into the surrounds. It is larger than the average garden cottage, looking more like a large farm house. The two structures that make up the garden cottage feature wood and stone, creating a very rustic and country-like look and feel. We can see how much the landscape plays a role. 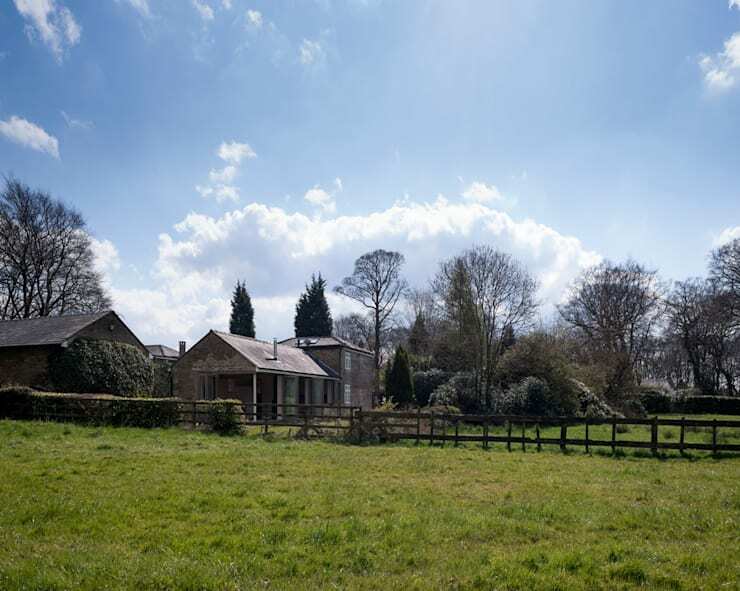 The beautiful fields and the paddock sets the tone for a very homely and gorgeous space. If we go a little bit closer to the home, we can see how the older elements of the original structure works in harmony with the new elements. The older stone facade contrasts beautifully with the fresh and chic interiors. We can see that the home also integrates the interior and exterior spaces perfectly. Large, modern glass doors open the home up onto the stone patio area. This visually and physically expands the interior living space, creating more interactive spaces for the residents. Glass is a wonderful addition for a home like this as it allows the family to have panoramic views of the surrounds no matter where they are in the house. 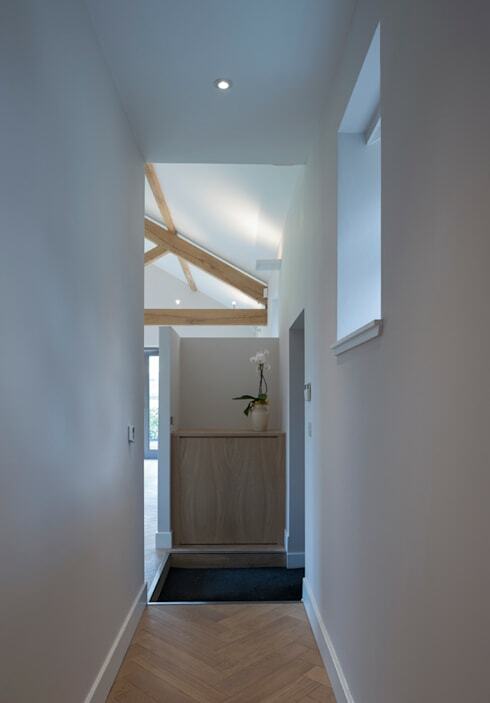 It also allows for natural light to flow through this space and creates a wonderfully ventilated space. If we head inside the home, we come across fresh and minimalist white walls with light wooden finishes throughout. This creates a clean and simple look. 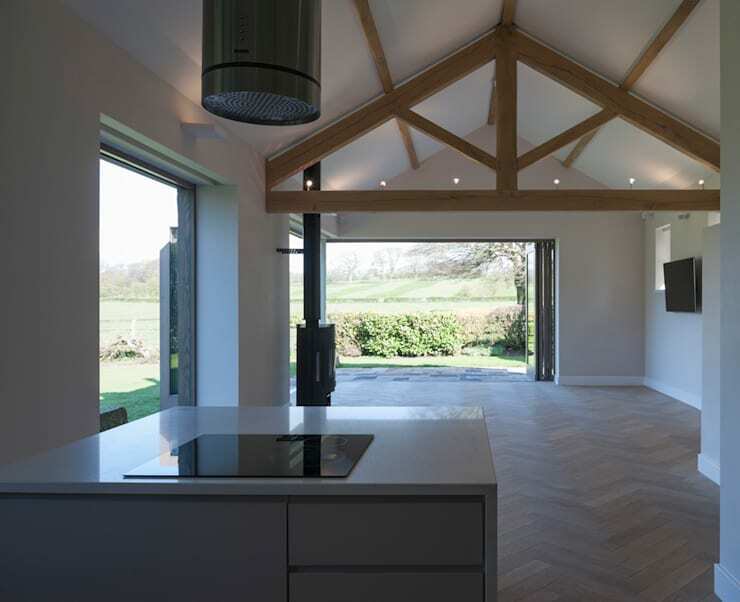 The light wooden beams that we can see dropping down from the ceiling in this image remind us that this is a garden cottage, bringing us back to the theme of the farm. The light wooden floors also add some warmth and homeliness to the space. On the right, we can see how a plush blue carpeted hallway leads away from the living space. This too adds some warmth, colour and charm. The designers haven't overwhelmed this space with decor items and accessories. A simple of vase of flower brings some fresh and natural beauty to the home – a great design tip! Have a look at these 6 simple ideas to decorate your hallway. If we head into the kitchen, we can see that it is the heart of the home! It features beautiful white cabinets and shelves, which work in harmony with the touches of the pink in the form of the walls. The pink doesn't overwhelm or dominate, however. It simply adds a touch of personality and colour here and there. The focal point of the room, however, is the large window, where the glass panes fold back to reveal an open space between the interior and the exterior. 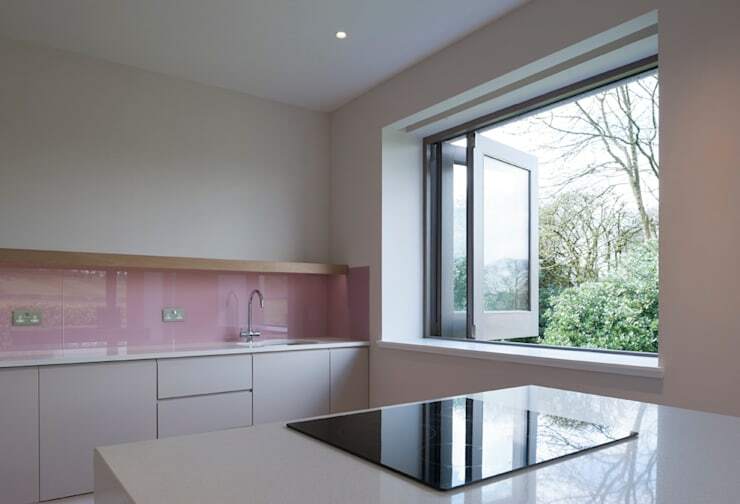 This creates a beautiful connection to the outdoors, while at the same time allowing for cooking smells to be ventilated through the kitchen and out into the fresh air. If we look out of the kitchen from this angle, we can see how the kitchen opens up into the living space, creating a beautiful flow throughout the home. This also makes the home look that much bigger and more expansive. We can also see how the soft colours in the kitchen work in perfect harmony with the whites and wood that we have seen throughout the rest of the home, creating a very warm and cozy space. We can see just how impressive the views are from the interior too! If you've loved looking at this home, then you'll love this coolest country home. What do you think of this new, renovated home?